When I posted On Second Thought, I Did Have a God-Moment, I discovered it was my twenty-fifth post on Reflections of a Lay Catholic. I doubt my two friends who invited me to participate ever thought I would be quite this prolific. It’s possible that, with each successive post, they shake their heads and utter, “There he goes again”. I occasionally receive comments from readers who express their appreciation to me for writing the things I write. But, I’m sure the reality of it all is that there are some who aren’t quite as enamored with my writing. Even in my own opinion I know there are some posts that are just plain better than others. Nevertheless, I do enjoy writing and posting. Rather, I enjoy the challenge of coming up with something about which to write – something that might be interesting and meaningful for others. But, mostly, I enjoy coming up with something meaningful to me. They say to be a successful blogger one has to post frequently, say several times a week. Well, I’m sorry, I’m not that quick. The thoughts I have take time to incubate. They take time to develop into something that makes sense to me, and then I have to wordsmith those thoughts into something that makes sense to others. This last piece is easy for me. It’s the first part, the making sense to me, that is difficult. The difficulty is a consequence of being new to the faith. I haven’t even been Catholic a year yet and so much is still new. I feel like I have a lot of catching up to do. I have surrounded myself with holy people from whom I glean tidbits of insight, knowledge and, occasionally, wisdom. It takes me time to process these. In addition, I try to read as often as the exigencies of life will allow: the Bible, devotionals, books by inspirational authors and Catholic apologists, all to try to increase my understanding of not only my Catholic faith but Christianity as a whole. Sometimes I feel I am drowning in newness. I have to sort through the minutiae to find what’s really important. There are a million dots that have to be connected. Being an engineer and an analytical thinker, I find myself trying to arrange it all into some kind of elaborate and logical process flow chart, with a beginning and an end, and with “If/Then” statements throughout. In my writing I intentionally steer clear of “hot topics” that are in the news. I tried once. In my post God Bless Planned Parenthood (which was not, as it sounds, in favor of that organization and it’s beliefs) I found that I couldn’t yet adequately defend myself or my position in the face of disagreement from readers and, thus, decided to leave those kinds of issues to others more knowledgeable and braver than me. Maybe someday I will get past the mere processing and understanding of ideas and into the synthesis of them such that I can organize what I have learned into an argument and feel comfortable enough to venture into that territory again. Until then, I will stick with writing about simpler ideas, the little revelations which, through my process of reasoning, become clear to me. I’ll stick to writing about those times when I find God has graced me in some particular way. But, mostly, I will write for my own understanding and learning, with my posts being the end result of my internal process of breaking down information, asking questions and generating suitable answers. Imagine what St. Augustine could have accomplished today with electronic media at his fingertips! 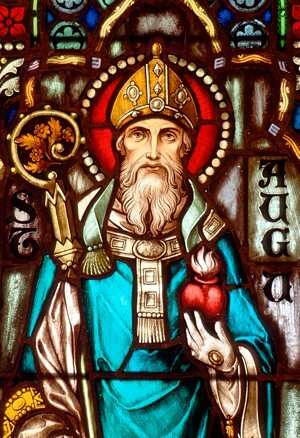 It is heartening for me to know that St. Augustine also found the real value of writing to be better personal understanding rather than simply a way of preaching to others. And, like I’m sure St. Augustine did, I too find some satisfaction in the evangelizing aspect of writing. For if, by organizing and compiling my muddled thoughts, I cause you, the reader, to think deeply about one of my personal experiences and relate it to yourself, or if I am instrumental in helping you understand and increase your faith, then I have compounded the singular value of my effort many times over. And that makes it all the more worthwhile. Please know that I appreciate you taking the time to read my monologues, and that I am very grateful for your comments and feedback. So many of you have helped me see my faith in new light, you’ve shown me where I’ve put pieces of the puzzle in the wrong places, and all of you have been there patiently listening while I, with God’s grace, try out loud to figure things out for myself. With each new post you strengthen me and remind me that I need to work less and reflect more—keep them coming. God Bless. Thanks, Rich. I wish you had more time so that you could share some of that spirituality and wisdom of yours with the rest of us. You have always inspired me.